Where to find Brackenheim hotels near an airport? Where can I find hotels in Brackenheim that are near tourist attractions? 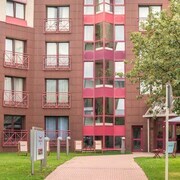 Travelers to Brackenheim are advised to think about booking a comfortable place to stay well in advance, as there isn't a huge range of hotels and apartments near Brackenheim's center. The closest of our hotels is the nestor Hotel Ludwigsburg, Baden-Wuerttemberg, which is located 25 kilometres (15 miles) from downtown Brackenheim. Also, try the Holiday Inn Stuttgart, located in Baden-Wuerttemberg, which is 30 kilometres (18 miles) away. 20 kilometres (12 miles) away from downtown Brackenheim, is the Schlosshotel Monrepos. Alternatively, the Ringhotel Adler is situated 20 kilometres (13 miles) away. 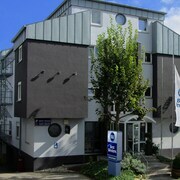 Some other places to stay here include the Das Wildeck and the Hotel Neckarblick. Looking for more things to do? Why not spend the day enjoying Heidelberg Castle and Thingplatz, which you'll find in Heidelberg, 45 kilometres (28 miles) to the northwest of Brackenheim. 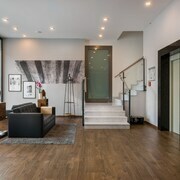 Should you wish to stay in Heidelberg, be sure to check out the Boutiquehotel Heidelberg Suites - Small Luxury Hotels and Hotel Europäischer Hof Heidelberg. 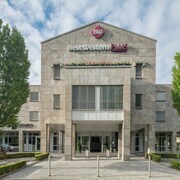 Or stay in Heilbronn, 13 kilometres (8 miles) to the northeast of Brackenheim, where you can choose from the Best Western Hotel Am Kastell and Vienna House Easy Neckarsulm. 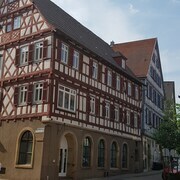 The Heilbronn Deutschhof and Experimenta Heilbronn are just some of the more popular attractions to check out should you visit Heilbronn. Get your sporting fix with a visit to Mercedes-Benz Arena, which is 35 kilometres (22 miles) to the south of Brackenheim. For travelers who are interested in booking a room nearby, make a reservation in the Le Méridien Stuttgart or Waldhotel Stuttgart. For those travelers planning on arriving or departing through Stuttgart Central Station Airport, you may like to stay at Althoff Hotel am Schlossgarten, or Steigenberger Graf Zeppelin, which are both close. What are the most popular Brackenheim hotels? Are there hotels in other cities near Brackenheim? What other types of accommodations are available in Brackenheim? Explore Brackenheim with Expedia.ca’s Travel Guides to find the best flights, cars, holiday packages and more!